In physics, the center of mass of a distribution of mass in space is the unique point where the weighted relative position of the distributed mass sums to zero or the point where if a force is applied causes it to move in direction of force without rotation. The distribution of mass is balanced around the center of mass and the average of the weighted position coordinates of the distributed mass defines its coordinates. Calculations in mechanics are often simplified when formulated with respect to the center of mass. It is a hypothetical point where entire mass of an object may be assumed to be concentrated to visualise its motion. In other words, center of mass is particle equivalent of a given object for application of Newton's laws of motion. The concept of "center of mass" in the form of the center of gravity was first introduced by the ancient Greek physicist, mathematician, and engineer Archimedes of Syracuse. He worked with simplified assumptions about gravity that amount to a uniform field, thus arriving at the mathematical properties of what we now call the center of mass. Archimedes showed that the torque exerted on a lever by weights resting at various points along the lever is the same as what it would be if all of the weights were moved to a single point—their center of mass. In work on floating bodies he demonstrated that the orientation of a floating object is the one that makes its center of mass as low as possible. He developed mathematical techniques for finding the centers of mass of objects of uniform density of various well-defined shapes. If a continuous mass distribution has uniform density, which means ρ is constant, then the center of mass is the same as the centroid of the volume. 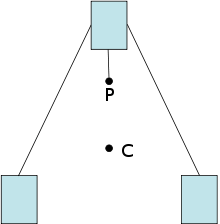 The center of mass is not generally the point at which a plane separates the distribution of mass into two equal halves. In analogy with statistics, the median is not the same as the mean. where m is the total mass of all the particles, p is the linear momentum, and L is the angular momentum. Newton's laws of motion require that for any system with no external forces the momentum of the system is constant, which means the center of mass moves with constant velocity. This applies for all systems with classical internal forces, including magnetic fields, electric fields, chemical reactions, and so on. More formally, this is true for any internal forces that satisfy Newton's Third Law. Estimated center of mass/gravity (blue sphere) of a gymnast at the end of performing a cartwheel. Notice center is outside the body in this position. Engineers try to design a sports car so that its center of mass is lowered to make the car handle better. When high jumpers perform a "Fosbury Flop", they bend their body in such a way that it clears the bar while its center of mass does not necessarily clear it. In kinesiology and biomechanics, the center of mass is an important parameter that assists people in understanding human locomotion. The human body’s center of mass is always changing because it is not a fixed shape. Typically, a human’s center of mass is detected with a reaction board or the segmentation method. The reaction board is a static analysis that involves the person lying down on the reaction board, and using the static equilibrium equation to find the center of mass. The segmentation method is a mathematic solution that states that the summation of the torques of individual body sections relative to a specified axis must equal the torque of the whole body system relative to the same axis. ↑ "The theory and design of British shipbuilding.". Amos Lowrey Ayre. p. 3 of 14. Retrieved 20 August 2012. ↑ "Helicopter Aerodynamics" (PDF). p. 82. Retrieved 23 November 2013. Center of Gravity at Work, video showing bjects climbing up an incline by themselves.